* Bioiden­ti­cal refers to the shape of the mol­e­cule — not the source of the hormone. * Bioiden­ti­cal hor­mones are derived from plants. * How­ever, just because hor­mones are plant-based doesn’t mean the mol­e­cules match. * Bioiden­ti­cal hor­mones can be applied trans­der­mally (onto the skin). * You get them from a com­pound­ing phar­macy. Your doc­tor must write you a prescription. 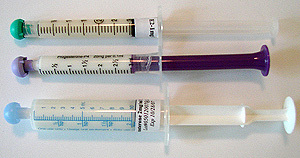 * Here’s what my pre­scrip­tion syringes look like. The green cap is my E2 (Estra­diol). The pur­ple cap is my P4 (prog­es­terone) and the blue cap is my testos­terone cream. * A rhyth­mic dosage (one that rises and falls) is rec­om­mended — ver­sus a sta­tic one (most phar­ma­ceu­ti­cal preparations).